QNAP has upgraded their line of NAS drives to include the one-bay TS-109 Pro II and two-bay TS-209 Pro II models. Both of these beefed up systems will include a Marvell 500MHz CPU and 256MB DDRII large memory, a faster BitTorrent download engine, built-in Joomla! CMS 1.5.1 and upgraded TwonkyMedia version 4.4.4. QNAP also claims that the P2P download speed is now the same as a PC-based BT download. Other features include support for DLNA, NFS and SMB multimedia sharing and a 1TB single SATA hard drive on the TS-109 (2TB with an external eSATA or USB drive) or 2TB for the TS-209. Unfortunately, No pricing or release date information has been announced. Taipei, Taiwan, April 2008 - The leading network-attached storage (NAS) provider QNAP Systems, Inc. today unveils the next generation Linux-embedded one-bay and two-bay NAS: TS-109 Pro II and TS-209 Pro II for power users, SOHO, and business users. The TS-109 Pro II and TS-209 Pro II series adopts high performance Marvell 500MHz CPU and 256MB DDRII large memory, which is a double of the memory size of the previous generation (TS-109/209 series) and becomes the best hardware specifications in the present SOHO NAS market. The Turbo NAS maintains superior system performance even if there are multiple accesses to various network services of the server concurrently. The new models are equipped with enhanced software functions, including the new BitTorrent download engine, built-in Joomla! CMS 1.5.1 for ease of PHP/MySQL-based web server hosting and upgraded TwonkyMedia version 4.4.4 for DLNA compliant media playing. Other professional features such as HDD S.M.A.R.T., complete log system, schedule backup from NAS to external storage device, etc. are also available. TS-109 Pro II and TS-209 Pro II series is the ideal choice of high performance and energy-saving NAS for modern business and home users. Besides the outstanding hardware specifications, the BitTorrent download performance of TS-109 Pro II and TS-209 Pro II series is largely enhanced. The high-speed DHT mode and TCP/UDP tracker protocols are supported to overcome the drawbacks of slow download of general embedded systems. You can now enjoy the level of P2P download speed as PC-based BT download. The optional firmware with encrypted BT is also provided on QNAP website for users who are suffered from traffic shaping by ISP to increase the download speed! QNAP also provides the remote management software-QGet to allow you to manage the download tasks of multiple NAS servers remotely over the local network or the Internet. According to Mr. Laurent Cheng, Product Manager from QNAP, "Most power users are used to using PC for BT download. However, PC-based BT download is energy-consuming and the fan is always noisy. As the performance of embedded system improves and evolves, we strongly believe that QNAP's energy-saving Linux embedded NAS will become an alternative solution to replace PC as a download server." 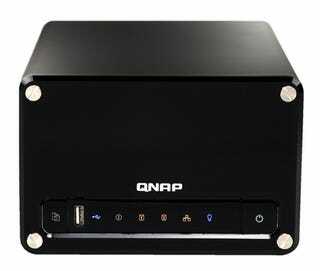 QNAP NAS is the NAS device with the highest compatibility with tens of different DLNA media players, Sony PS3, and Microsoft Xbox360 gaming consoles. With the upgraded TwonkyMedia version 4.4.4, the popular DivX video can be streamed to Sony PS3 from NAS. Users can enjoy more of the music, photos, and video sharing function in the home network. Moreover, the Turbo NAS Pro series works well with NFS supported High-Definition (HD) DMA for HD video streaming. They can also be connected to XBMC (modded from Xbox gaming console) via SMB for media playing. The high compatibility, energy-saving and reliable features have made QNAP NAS the first choice for setting up the digital home multimedia centre. The advanced functions which are only available in enterprise-level NAS models are now supported in QNAP Turbo NAS series. The HDD S.M.A.R.T. (Self-Monitoring Analysis and Reporting Technology) is supported for users to monitor the status of hard disk drive and check the potential problems. The comprehensive log system allows administrator to track the file-level connection logs and the status of all online users. The Turbo NAS provides numerous built-in functions which can be easily managed via the web interface, e.g. network storage, file server, encrypted FTP server, encrypted remote replication, printer server, etc. The intelligent backup software NetBak Replicator is also offered for users to back up data from multiple Windows PCs to the NAS. Also, Windows AD authentication is supported for efficient user account management and reduced maintenance cost. QNAP TS-109 series supports up to 1TB single SATA hard drive. The total storage capacity can be expanded to 2TB with an external eSATA or USB drive. With the unique fanless design and aluminum alloy case, the noiseless TS-109 is suitable for operation in digital home environment. Moreover, the power consumption rate of TS-109 is less than 14.4W under normal operation. This energy-saving design enables the server to run 24x7 non stop. TS-109 series supports 12-in-1 complete functions and high transfer performance. TS-109 Pro was honored the "The Best NAS Box" from MAXIMUMPC (US), "Lord of NAS" from Hexus (UK), and "Golden Bear Award" from Bjorn3D (US) etc. QNAP TS-209 series is the only 2-bay, RAID 1, hot-swappable NAS model in the current SOHO NAS market. With 12-in-1 functions, the maximum storage capacity supported is 2TB. TS-209 is a perfect large-storage and high security solution for home, SOHO, and SMB users. TS-209 Pro was honored "Gold Medal Award" from ComputerGEIL.dk (Denmark), Golden Award from InfoMods (France), and "Product of the Year 2007" from Hardware-TEST.dk (Denmark) etc.